I spent the night camped off Nevada SR160 north of Pahrump, hoping to do some peakbagging in the area the next day in spite of the expected storm. The rain started shortly after I laid down to sleep in the back of the van and kept up a steady patter on the rooftop pretty much all night long. In the morning I noted that the intensity of the rain in reality didn't match the amplified sound I'd gotten through the roof and decided to do a few easy peaks from Courtney's Rambles & Scrambles since the precipitation wasn't that bad. A rainjacket sufficed for wet weather gear, my pants sometimes getting wet but the wind drying them almost as quickly. My boots wouldn't dry as easily but they never soaked through to my socks in the few hours I was out, so it worked out well with the on and off again drizzle and heavily overcast skies. 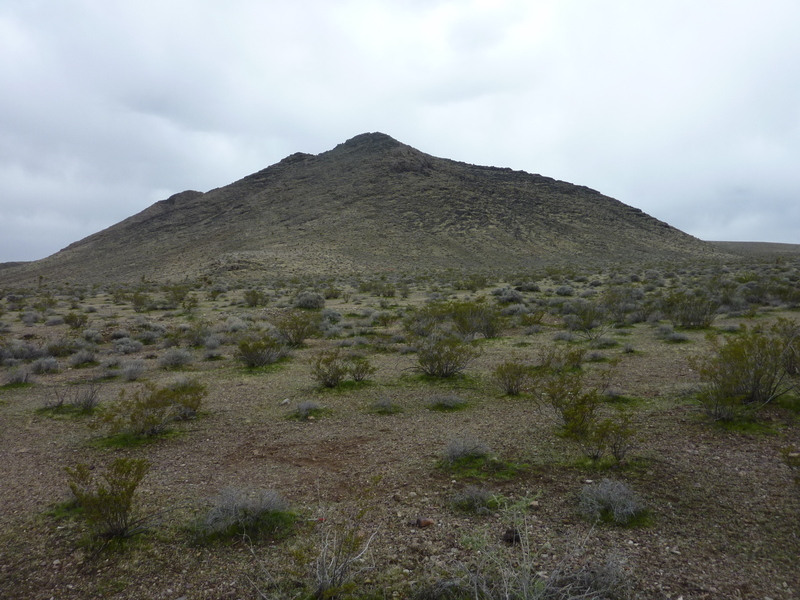 This is the northern most summit in the Last Chance Range just north of Pahrump (not to be confused with the similarly named range in Death Valley). Courtney describes a good dirt road off the highway north of the summit that can be used to access the suggested route up the North Ridge. I found the road driveable by the van and used it to drive in about a quarter mile, but the summit is only 2mi from the highway so there isn't that much to be gained. I took about an hour and a quarter to climb the 1,500ft to the summit along the ridgeline, finding one section of class 3 with the rest class 2 on decent, but not great limestone. The nice part is that the limestone maintains good traction even when wet. From the summit one can survey the surrounding desert, almost immediately noting the much higher and more impressive range highpoint to the southwest. How is that the this other summit with 1,700ft of prominence gets no mention in the guidebook? A small mystery. In drier weather I might have tried traversing the 1.3mi along the crest between the two, but not today. I decided to descend to the northwest off the summit and into an interesting-looking drainage on the west side of the ridge. It would prove longer in both time and distance than the ridgeline, but it made a nice alternative and gave me a chance to study the many varieties of desert grasses and shrubs that were beginning to green nicely with the recent rains. It's really quite amazing how many hundreds of seeds can lay dormant in a square foot of desert terrain, only to spring to life with a bit of prodding from a fresh rain shower. There were some small pools in the gully but no running water, at least yet. If the rains really started to come down I'd have to scramble to higher ground to avoid a sudden surge down the canyon. The drainage led to the dirt road I had driven in on, the last 2/3 mile finishing up along the road. I didn't check, but I'm pretty sure the name comes from some animal skull that Courtney ran across while climbing it. The summit is the highpoint of a two-mile ridge that stands alone between the main crest of the Last Chance Range and SR160. The climb from the road up the East Face rises 700ft in 1/3 mile, a pretty steep limestone slope. Courtney describes it as as "enjoyable scramble" but I thought it somewhat mundane. Maybe that was because it was still raining lightly, but it's also because the rock is rather broken without much of what I would consider good scrambling. Still, it wasn't hard and only took about 15min to make my way to the summit from where I parked on a dirt road near the highway. In better conditions it would have a nice view of Pahrump and the Spring Mtns, but all was pretty hazy today through the drizzle.